Kerri and Krysta Carr received awards from the Foundation for Sight and Sound and the Help America Hear Program. In late 2010, Kerri and Krysta Carr received awards of recognition from the Foundation for Sight and Sound and the Help America Hear Program. 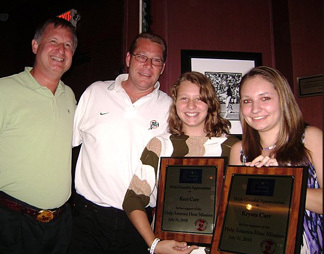 The girls’ father, David Carr, owns McGuire’s Hearing throughout eastern Suffolk County, and is a board member of the Foundation for Sight and Sound.